A few years ago I witnessed an eCoupled presentation of wireless power. While the underlying tech is nothing new, the execution is probably miles away from what Nikola Tesla imagined. 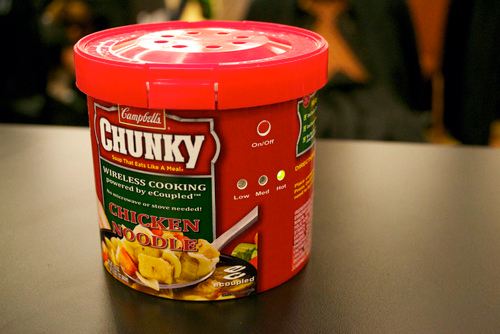 For example, news coming out of CES 2011… food that cooks directly in the packaging… and no, not in a microwave. Fulton Innovation is the company behind eCoupled technology and they have designed printable coils that can be embedded directly into product packaging. The result? Smart packaging that can not only interact with a smartphone or PC (think everything form recipes to nutritional information), but can also draw enough power to cook food directly in the packaging! The ‘controls’ would be printed on the packaging, so end users would simply have to pull a tab (or some other similar process) and set the package down on an eCoupled-enabled surface. The magic happens thanks to inductive coupling if you want to look it up, but for now, all you need to know: the soup that eats like a meal is soon to be available in packaging that cooks like a microwave.